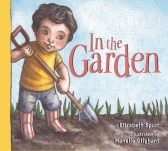 Use the Rafflecopter form to enter to win this fabulous board book just in time for spring planting. Help your child get outside to work outside. Want to know more about this book? Read my REVIEW. Contest Details: Contest starts 4/22/2012 and ends 5/1/2012 at 11:59 EST. By entering, you have acknowledged the terms on the Rafflecopter form and agree to them. You agree to have your name published on this blog and other social media sites as the winner. **This is not a sponsored post. The book is provided by the publisher. I did not receive any compensation for posting the giveaway. I have 3 children of various ages (12, 9, 2) so I make sure that whatever task they are given is fun and age appropriate. My oldest son likes to pretend he is mining for diamonds. Let them help count out seeds for the things planted in mounds. We do container gardening - and I give each child a 16-20" pot to plant their own garden. Pizza gardens are a lot of fun and the kids love eating what they grew! My kids love doing anything outside and all I have to do is tell them we're going to plant something for them to get excited and they LOVE watering the plants. My four and eight year olds love watching the plants grow. We water them every day together and check how much they've grown. We all love gardening! To have really cute gardening "tools", or to integrate games or learning into the task. :) I they have their own special portion of the garden that they get to raise they will be very excited to see the progress each week! I buy them their own size of garden tools to help work in the garden. One way to get children interested in the garden is allow them to fill up the water buckets with the hose and have them water large plants that wont break easily. Give them a small plastic shovel and let them dig! MY grandson already at 1 years old loves to help in the garden. We provide a toy wheelbarrel & garden tools. my grandkids loves to dig and plant the seeds. So when it comes up I tell them this is your garden and they water it too. I think the key is to let them prepare and eat what they grow. To see it from seeds to delicious meals. They can help plant the seeds and water and weed. kristiedonelson(at)gmail(dot)com Thank you. Give them something fun to plant and watch grow like a sunflower or a pumpkin! My children love to dig in the dirt and help in the garden. They have child rakes, hoes, and shovels to help. Plus they love to plant seeds, water them and watch them grow. I always tell them what a great job they have done. Thanks for the chance. My daughter doesn't need any coaxing! She loves to play in the dirt, use the tools, and water the plants. Getting a child their own garden tools and watering can might help get them interested if they are reluctant.